As a whole, chameleons have a number of behavioral characteristics which can be extremely important when seeking to understand them. Some of these characters are critical for captive management and propagation and others are simply interesting to those who wish to understand their existence. To start with, chameleons are generally solitary animals that are considered shy by nature. While members of the genera Brookesia, Rhampholeon and Rieppeleon are known to be quite accepting of members of their own species, most typical chameleons are intolerant of cohabitation with the exception of during mating and courtship. (See article, Cohabitation) Understanding that chameleons are shy by nature can help improve care techniques. For one thing, from this it is clear that chameleons generally do not do well with high activity levels in the vicinity of their immediate environment. Similarly, they do not appreciate frequent interaction with their keeper and often react poorly to frequent handling or unneeded observation. Chameleons often lean around branches to try to hide from disturbances. These types of situations are highly stressful for chameleons. Juvenile male Trioceros montium hiding behind branches to avoid detection. Communication techniques are another valuable behavior to understand. The first method of communication is color change. It is well known that color can be an indicator of health, reproductive condition and stress. Understanding what your chameleon’s normal colors include, what typical stress colors for your species are and what typical gravid colors for your species are can greatly aid in the care of your animal. Abnormally dark coloration generally indicate stress, illness or too low of temperatures. Atypical sedentary behavior, sleeping posture during the day and lack of eating are also common signs. Abnormally light coloration can indicate high temperatures, stress or illness as well. Gapping with these colorations can indicate illness or high temperatures. Vivid coloration and patterning can be used to spot stress, gravidity or territorial display. In all cases, analysis of the circumstances and environment under which the color was exhibited are needed to determine the cause. A less known form of communication common to many but now all chameleons is the use of low frequency sound to communicate. This is known to be used in courtship, defense and territorial displays. Consequently, it seems obvious that while chameleons cannot hear our normal range of sounds, low frequency noises should be avoided in the area around chameleons. More information about this communication can be read in the article Vibratory Calls in True Chameleons. The way chameleons walk is often a topic of concern to new chameleon enthusiasts. 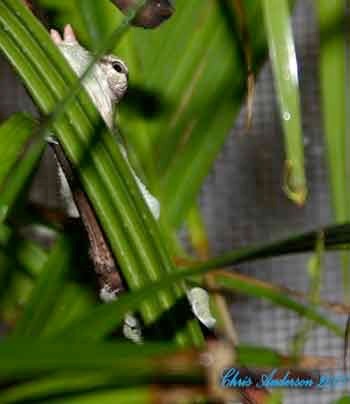 To break up their image to predators, chameleons often try to mimic a branch in the wind. To do so, they often walk very slowly while the rock back and forth as they advance very slowly. This is not abnormal and nothing to be concerned about. While there is a great deal more common chameleon behavior, it would be almost impossible to describe all of it. As one’s experience increases, many of these behaviors become valuable tools in determining the health and condition of animals and can be extremely valuable as such.